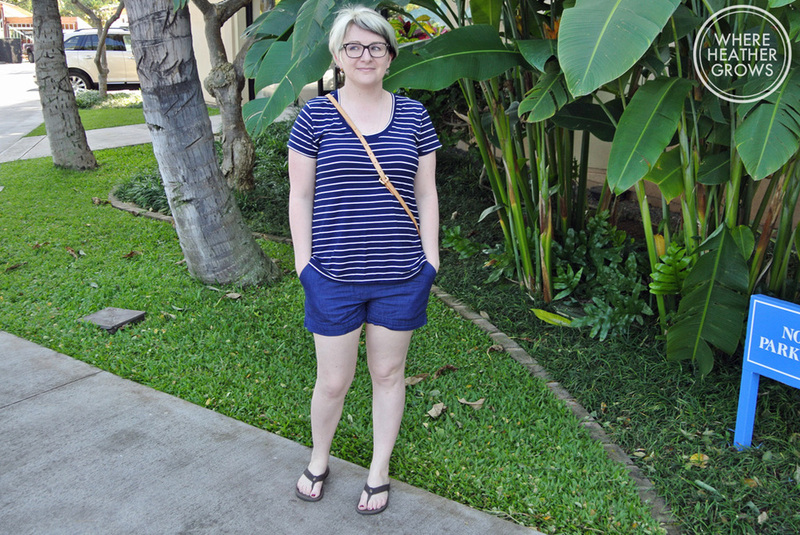 So on a trip to Maui, not only do you need some cute dresses, you also need some easy basics too. Enter the Deer & Doe Plantain pattern (and if you don't have it already, go get, it's free and it's awesome!). I've made this pattern a number of times, and it's super easy to whip up. This one is made from a gorgeous bamboo jersey knit from Blackbird fabrics. This fabric is super drapey and feels amazing. It's so dreamy! Where has bamboo jersey been all my life?? It's also nice and breathable, so feels cool against the skin. Also pictured are a pair of Carolyn shorts. I made them out of a lightweight denim that came from Joann's (when we were in Palm Dessert last November). It might be a little grandma-walmart-jeansish, but it's soft and comfy and I think it works as long as I keep the elastic waistband hidden. 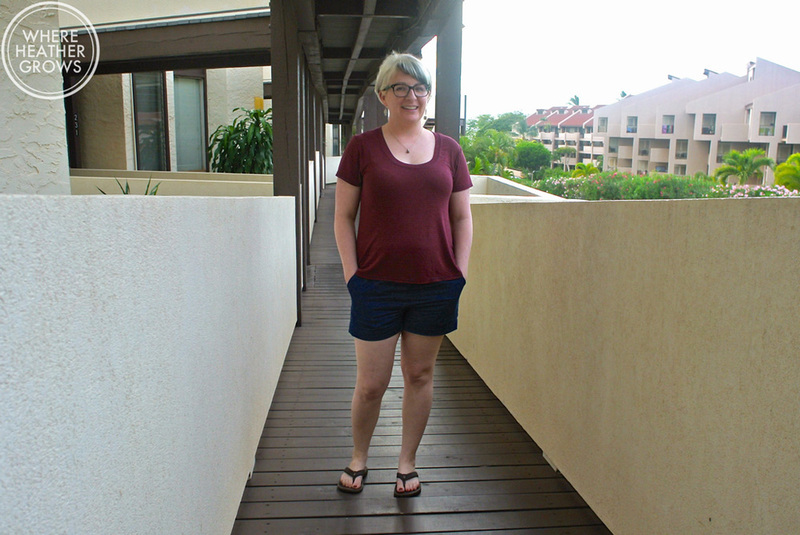 I was a little worried that these might be a little too short for wearing out of the house, but once we got to Maui, this fear disappeared. I have worn them here a ton! I'll probably make another pair or two for the summer out of different fabric (I'm thinking linen or a cotton/linen blend of some sort). I think they would also be really cute with back pockets added. This Plantain is made from a lovely knit I got from Wanderlust Fabrics. I can't remember the content exactly, but I think it's got a bit of rayon in it as well. I got it months ago when my hair was pink, and I've been saving it for when my hair would inevitably change and wouldn't clash as much. I used to have a RTW shirt with the same colour of stripes and I loved it, so when I saw this fabric I bought a yard with plans to make a t-shirt. Can you see the micro stripes? This fabric is super nice and soft too and was really nice to work with. Paired again with my Carolyn shorts. Told you I wore them a lot! This lovely purple Plaintain is made from a cotton spandex jersey from Girl Charlee. It's not quite as drapey as the other two, but just as comfy. All three of these tees are a straight size 44, and I shortened them by about 2 inches after I made them. They were all constructed with my serger and topstitched with my converstitch machine. 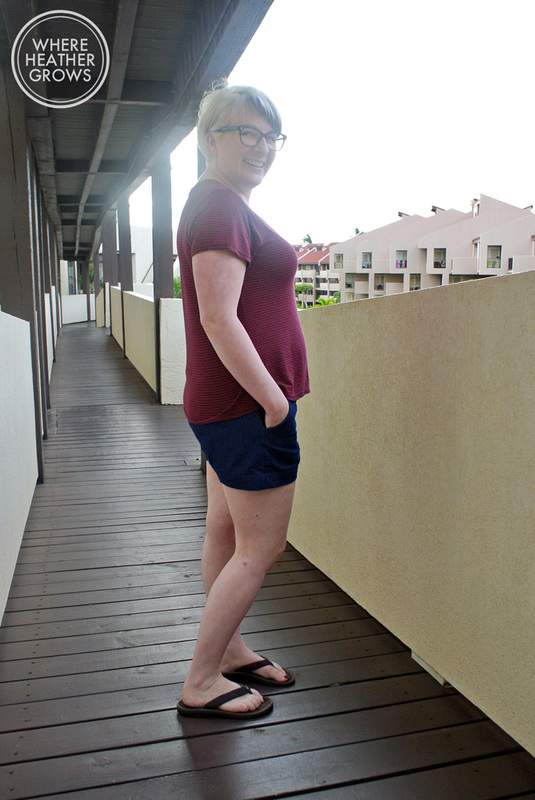 With this one, I am wearing my very first pair of me-made shorts (I made them last summer). 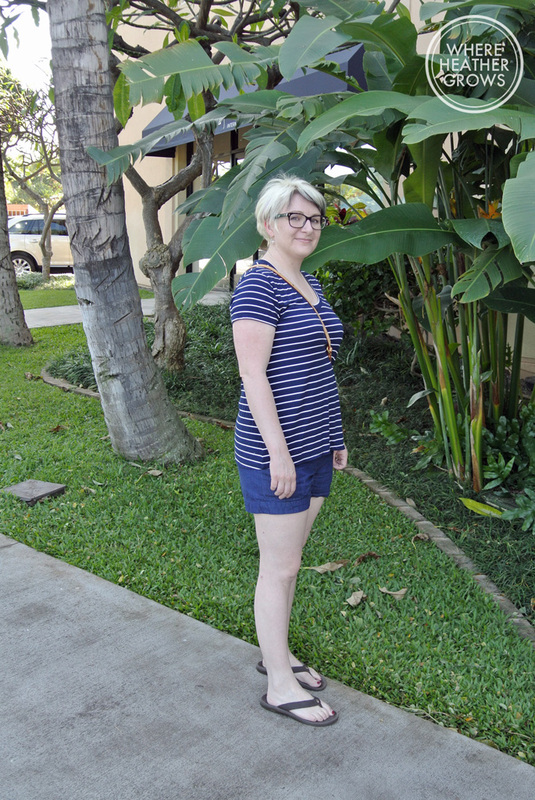 I used the Juba shorts pattern and if you are interested, you can read my post about them here. We are getting ready to head home tomorrow. It's been a lovely trip, but I'm ready to get home to the pugs, and to sleep in my own bed, and to sew!! I can't believe how much I've missed it. What do you miss most when you go on holiday? Do you miss your hobbies too?